This is AWESOME Joyce! Thanks for the video ... great job! I LOVE the background and how smart to die cut from that pretty sparkle paper and overlay! GREAT JOB! Dang! Now I wish I had ordered some of those Disney dies when they were available at the store! Fabulous inspiration ... what fun! Beautiful! Love every element you used! WOW! 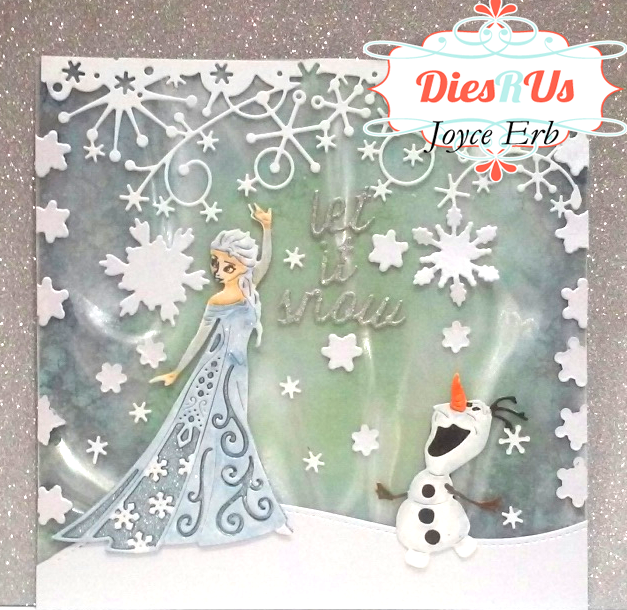 what a wonderful card with a popular Disney character...these dies are great! Amazing card, Joyce! I love the layered dress on Elsa. Perfect! I also have the Vertigo vinyl and it embosses great too. Wow~ This is awesome Joyce! You did an amazing job adding the detail to these die cuts. Super fabulous!